Cave Lombrives is one of the largest caves in France. It is in Ariège, near Tarascon-in-Ariège . This huge cave was carved by the water of the Ariege. 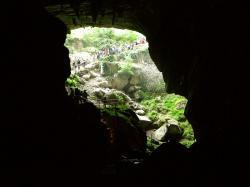 By dint of passage, the river formed a 39-kilometer long karst system which consists of 7 levels. There are also over 200 entries! It is difficult to say when the cave was inhabited for the first time but we know it served as a refuge many times. First for the prehistoric man and for hermits, lepers, shepherds or robbers and counterfeiters. She was also a refuge for Cathar bishop Amiel Aicard in 1244, following the fall of the castle of Montsegur but also for priests and nobles hiding from Republicans during the French Revolution. An engraving dating from 1578 mentions King Henry IV but there is no evidence of his coming. Info: Hôtel Thermal du Parc is located at the thermal resort of Ussat-les-Bains, on the banks of the River Ariege. It has a restaurant, indoor pool and tennis court. Info: Le Manoir D'agnes is located in the Pyrénées village of Tarascon-sur-Ariège. It offers air-conditioned guest rooms, each with a private bathroom, flat-screen TV and free wired internet. Info: The Hotel Confort is located in the heart of the Pyrénées Ariégoises in the historic city centre of Tarascon-sur-Ariège. The hotel offers free Wi-Fi and free parking. Info: Located in Tarascon-sur-Ariège, Hotel Le Bellevue offers modern accommodation just a 10- minute walk from the train station. Free Wi-Fi and newspapers are available at the hotel.